A very special and unique Siddh Kamdev Vashikaran Mantra using either toothpaste, betel leaves, flowers or fruits as infusion objects for enchanting and casting a very potent and accurate Love Spell on a desired man or woman has been described in this post. This Vashikaran Mantra can be practiced by using two different methods and even though, it is sometimes said to be a Stri or Woman Vashikaran Mantra, it can be effectively used by both men and women to entice and fascinate any desired lover or even the husband or wife. 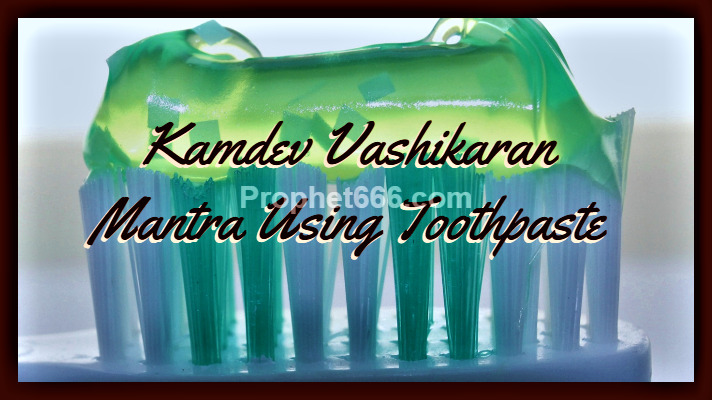 Both the methods can be practiced on any day and even though, the God of Love and Attraction Kamdeva has been mentioned in the Vashikaran Mantra, there is no need to worship Kamdeva or perform any other ritual other than what is described in this post. 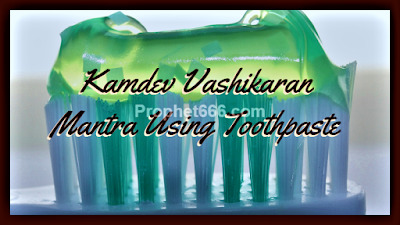 1] To enchant a desired person by using toothpaste, betel leaves, fruits or flowers. Any of the infusion objects mentioned above should be held in the right hand and the Kamdev Vashikaran Mantra given below should be chanted 21 times in order to infuse the object with the vibrations of the Vashikaran Mantra. Then, the Kamdev Vashikaran Mantra infused object should be given to the desired person to use or consume. As per the Tantra, that person will surely come under the Vashikaran Spell of the practitioner and become fascinated by him. 2] To enchant any desired person using flowers. The practitioner has to keep a handful of fresh Lal Kaner Ke Phool before himself and sit down comfortably and chant the same Kamdev Vashikaran Mantra 108 times. The practitioner can use any kind of counting rosary for counting the number of Mantra Chants. Then, as per the writings of the Kamdev Vashikaran Tantra, the Red Kaner Flowers have to be put before the desired person. When the desired person comes across or steps upon these flowers, he or she will come under a strong enchantment spell and surrender to the wishes of the practitioner and start behaving like a slave. Note- This Kamdev Vashikaran Mantra should never be used for wrong purposes or to harm any person or to force yourself on any person against his or her free will. Kamdev Vashikaran Tantra contains some of the most powerful Vashikaran, Mohini, Akarshan, Sammohan and other Occult Attractions Spells. A lot of Mantras and Yantras, which make the use of this Tantra can be seen in the various sections of our site, including the sections on – Attraction Mantras and Spells, Vashikaran Totke and Remedies and Vashikaran Yantras and Love Charms. I had been into marriage since 6 months but I am having so much problem in my married life.